With the seasonal progression of the sun to the northern hemisphere, surface water temperatures in the South Pacific have cooled a bit, bringing relief to South Pacific corals. A full-fledged global bleaching event continues to be likely. Warming in the equatorial Indian Ocean has caused bleaching in the British Indian Ocean Territory and the Maldives. Warming also has begun in the Caribbean, with extensive bleaching watches and some warnings present along the southwestern Caribbean coasts. The declared El Niño continues to build with both Kelvin waves propagating from the west into the eastern Pacific and wind shifts that further strengthen and maintain the El Niño. This El Niño is likely to further exacerbate anomalously warm waters off the U.S. west coast. Coral Reef Watch (CRW) continues to expect another global-scale bleaching in 2015 but hopefully not as severe as the 2010 event. However, some locations may suffer worse bleaching this year than in the past, just as we saw record thermal stress in the northernmost Mariana Islands and the Northwestern Hawaiian Islands in 2014. Our greatest current concern is the upcoming Caribbean bleaching season, although some unusual developments are appearing in the Four-Month Coral Bleaching Thermal Stress Outlook, including the potential of bleaching again this year in Hawai'i. Except where noted, the following report comes from the newly released Coral Reef Watch 5-km satellite coral bleaching thermal stress monitoring products and the recently updated Four-Month Bleaching Thermal Stress Outlook. Bleaching conditions have subsided in the South Pacific, bringing relief to bleached corals in the Solomon Islands, Vanuatu, Tuvalu, Fiji, and the Samoas, among others. Along the equator, El Niño conditions have produced an extremely warm band of water from the central equatorial Pacific to the South American coast. Satellite Bleaching Alert Level 2 (signifying widespread coral bleaching and mortality) has been reached in the Gilbert, Phoenix, and Northern Line Islands in Kiribati, as well as in the Howland and Baker Islands and to the east in the Galápagos; Bleaching Warnings were recently issued for Micronesia as well. As El Niño conditions continue (and are predicted to strengthen), thermal stress is expected to continue to accumulate across the equatorial Pacific from the Gilbert Islands to South America, with all central to eastern equatorial Pacific reefs under Bleaching Alert Level 2; reefs in the Federated States of Micronesia and the Marshall Islands may reach Alert Level 1 within the coming weeks as well. In a surprise development during the past two weeks, climate models now indicate that Kelvin waves driven by the intensifying El Niño may interact with a large mass of anomalously warm water in the eastern North Pacific, intensifying anomalously warm water there. CRW's Four-Month Outlook is now calling for this patch of warm water to expand off the Mexican coast and migrate northwest to potentially embrace the Main Hawaiian Islands in September. These conditions are very unusual, as thermal stress in the Hawaiian archipelago usually occurs when warm water in the western North Pacific moves south or southeast into the Northwestern Hawaiian Islands. We recommend those concerned about conditions in Hawai'i continue to consult the Outlook weekly. Note on the eastern tropical Pacific: The accuracy of CRW's 5-km products should have improved remote monitoring of coral reef environments in this region significantly over the heritage 50-km products. The 50-km products were known to overestimate thermal stress in the eastern tropical Pacific, including the Pacific coasts of Costa Rica, Panama, and out to the Galápagos Islands. This was largely due to errors in the old climatology used with these products. The new climatology (Heron et al. 2015) being used for CRW's new 5-km products is much warmer in this region than the 50-km climatology and hopefully has alleviated that problem. However, recent observations by scientists working in the Galápagos suggest CRW's 5-km products still may overestimate bleaching for some islands there. While under the influence of large-scale thermal stress in the eastern equatorial Pacific, fine-scale oceanographic patterns in the Galápagos may protect many coral reefs, especially in the southeastern islands. Also, rainy season clouds, typical of this time of the year, and expected to be further enhanced by the ENSO, may help reduce the chance of bleaching along the Pacific coasts of South and Central America. Finally, Australia's Great Barrier Reef has frequently seen bleaching conditions in the austral summer following El Niño events. While our models do not predict bleaching that far into the future, the strength of this event raises concerns that we may see bleaching continue into early 2016. Warming in the central Indian Ocean has placed most reefs, except for those along the African coast, under a Bleaching Watch or Bleaching Warning. Extensive and severe bleaching has been reported in the British Indian Ocean Territory by the Khaled bin Sultan Living Oceans Foundation and Catlin Seaview Survey divers. Additionally, local experts have reported variable bleaching across the Maldives. Bleaching in these archipelagos has been more severe than we would have expected from the level of thermal stress. A Bleaching Warning extends from the northern Indian coast to the Saudi Peninsula and the Horn of Africa. Bleaching Watches exist from India east to the western coast of Sumatra with some patches of higher thermal stress. CRW's 4-Month Bleaching Thermal Stress Outlook calls for Alert Level 1-2 conditions to continue around the Maldives and to the west of India through June, before cooling. Some intensification of thermal stress may continue along western Sumatra, at least through June. Bleaching conditions also may continue to the east of India to western Myanmar during the next few weeks. Bleaching Watch or higher conditions have developed throughout much of Southeast Asia and the Coral Triangle. A Bleaching Warning exists from Vietnam east through most of the Philippines. Some intensification of bleaching conditions is expected in interior seas of the Coral Triangle through July, cooling by August. At this point, CRW's 4-Month Bleaching Outlook indicates that major bleaching is unlikely in most of the Coral Triangle during 2015. The bellwether region in the southwestern Caribbean has already warmed. Any year in which major Caribbean bleaching has occurred has experienced warming in the area off Panama and Colombia. 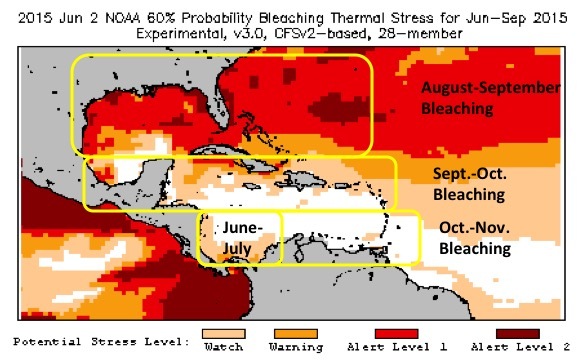 A Bleaching Watch began in this area in early April and spread into many Caribbean areas, including the Turks and Caicos Islands (east of Cuba). Bleaching Watch conditions now extend from Colombia to central Mexico and are present in a few spots in the central and northern Caribbean. Part of the Colombia-Panama border region has reached Bleaching Warning status and continues to intensify. The unusual early warming around the Turks and Caicos in late April cooled off with the formation of Atlantic tropical storm Ana - again an unusually early event at the start of May. CRW's Four-Month Bleaching Thermal Stress Outlook calls for intensification of bleaching conditions as the season progresses. By September, Alert Level 1 conditions are already predicted for coral reefs in parts of Florida, Cuba, the northern Bahamas, and Bermuda. Much of the warmest conditions are at long (4-month) lead times when model skill is lower than shorter lead-times. The 4-Month Outlook extends only through September 2015 at this time. So, while the Outlook currently shows little risk of bleaching in the central to southern Caribbean, this is primarily because it is currently too early to predict bleaching in October and beyond. The above image provides approximate timing of the expected "bleaching season" across the Caribbean. Model skill tends to decrease at longer prediction times; therefore, please continue to monitor CRW's Outlook in the coming weeks to see what is predicted for the later periods. Historical data tell us that teleconnections between El Niños in the Pacific and Caribbean climate often result in high temperatures and bleaching in the Caribbean; however, the El Niño we are experiencing now is unusual in many ways. Our sincere thanks to the many observers who have reported bleaching to Coral Reef Watch over the last few months. As always, please send all coral health observations to coralreefwatch@noaa.gov and/or the NOAA/ReefBase collaborative online bleaching report system. Your observations (including reports of no bleaching/healthy corals) are greatly appreciated as they continue to help us improve reliability of our products. Should you have any questions or feedback on Coral Reef Watch's products, please send an e-mail to: coralreefwatch@noaa.gov. We encourage you to watch Coral Reef Watch's 5-km satellite coral bleaching thermal stress monitoring products and 4-Month Bleaching Outlook at: https://coralreefwatch.noaa.gov/satellite/index.php. Heron, SF, Liu G, Eakin CM, Skirving WJ, Muller-Karger FE, Vega-Rodriguez M, De La Cour JL, Burgess TFR, Strong AE, Geiger EF, Guild LS, Lynds S (2015). Climatology Development for NOAA Coral Reef Watch's 5-km Product Suite. NOAA Technical Report NESDIS 145. NOAA/NESDIS. College Park, MD. 21pp. The content posted on this web page solely represents the opinions of the authors and does not constitute a statement of policy, decision, or position on behalf of NOAA or the US Government.